This countdown is based on GMT Correlate your time zone with the chart below to determine whether new moon takes place before or after your local sunrise. 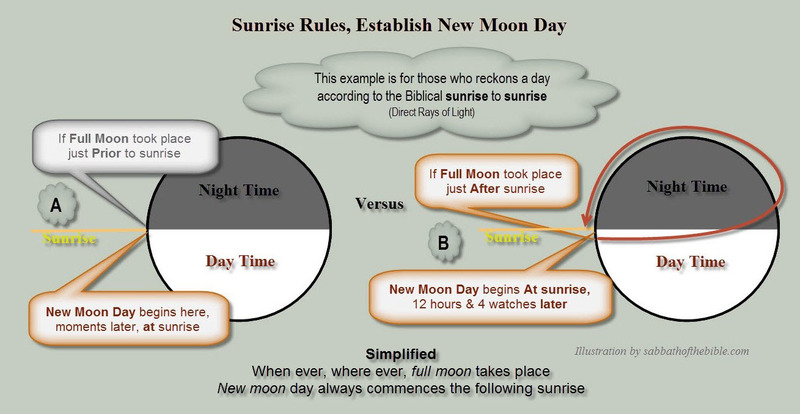 Sunrise Rule for determining your Sabbaths. This site does not maintain a monthly calendar. Why? The reason for this arises with the interference of the Gregorian calendar. Satan has made it almost impossible as two of his pagan days overlay a single day of our Creator. This makes a single calendar nonfunctional for all the man made time zones located all around the world. If the astronomical full moon takes place prior to your sunrise (during your dark hours), your new moon day will begin at that sunrise. If the astronomical full moon takes place during your daylight hours, your new moon day will begin at that sunrise. At creation, our Creator hung His calendar in the heavens. Psalms 19:1 Just as Daniel 7:25 had prophesied, Rome in their attempt to gain worship to themselves, has removed the original calendar of creation from the minds of man. Their calendar, well, their counterfeit is only able to hang on a wall, But only with the aid of a nail. A "Full Moon" For Two or Three Days!